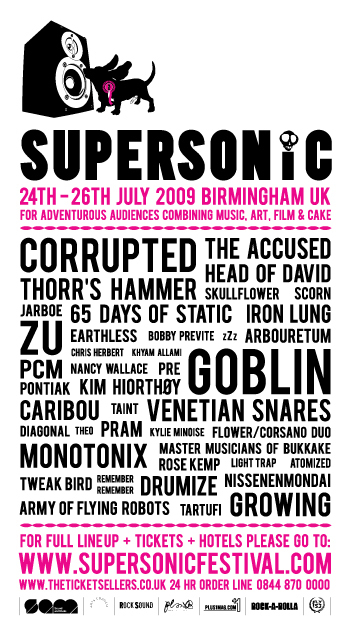 Even more bands confirmed for Supersonic!!! We are delighted to add a few more extraordinary acts to perform at this years Supersonic Festival, including Japanese all girl band NISSENMONDAI, a 10 piece collaborative project in the form of DRUMIZE (feat. DJ SCOTCH EGG + ex members of the BOREDOMS + TRENCHER), TWEAK BIRD a brother duo who produce heavy experimental prog and psych-infused rock (a definite one for fans of the MELVINS), LIGHT TRAP which is the latest project of Nicholas Bullen (original member of Napalm Death + Scorn) in collaboration with none other than Johnny Doom and the drummer from Una Corda.